A protein-coding gene starts with an “ATG”, which is followed by an integer (whole) number of codons (DNA triplets) that code for amino acids, and ends with a “TGA”, “TAA”, or “TAG”. That is, the start codon of a gene is always “ATG”, while the stop codon of a gene can be “TGA”, “TAA” or “TAG”. You can see from this table that “ATG” is translated to Met (the amino acid methionine), and that “TAA”, “TGA” and “TAG” correspond to Stp (stop codons, which are not translated to any amino acid, but signal the end of translation). To look for all the potential start and stop codons in a DNA sequence, we need to find all the “ATG”s, “TGA”s, “TAA”s, and “TAG”s in the sequence. To do this, we can use the “matchPattern()” function from the Biostrings R package, which identifies all occurrences of a particular motif (eg. “ATG”) in a sequence. As input, the matchPattern() function requires that the sequences be in the form of a string of single characters. The output from matchPattern() tells us that there are two “ATG”s in the sequence, at nucleotides 4-6, and at nucleotides 16-18. In fact, we can see these by looking at the sequence “AAAATGCAGTAACCCATGCCC”. Similarly, if you use matchPattern() to find the positions of “TAA”s, “TGA”s, and “TAG”s in the sequence “AAAATGCAGTAACCCATGCCC”, you will find that it has one “TAA” at nucleotides 10-12, but no “TAG”s or “TGA”s. # Find all occurrences of codon "codon" in sequence "sequence"
# Find the start positions of all occurrences of "codon" in sequence "sequence"
# Find the total number of potential start and stop codons in sequence "sequence"
# Make a copy of vector "codonpositions" called "positions"
# Make a vector "types" containing "numoccurrences" copies of "codon"
The result of the function is returned as a list variable that contains two elements: the first element of the list is a vector containing the positions of potential start and stop codons in the input sequence, and the second element of the list is a vector containing the type of those start/stop codons (“atg”, “taa”, “tag”, or “tga”). The output for sequence s1 tells us that sequence s1 has an “ATG” starting at nucleotide 4, a “TAA” starting at nucleotide 10, and another “ATG” starting at nucleotide 16. We can use the function findPotentialStartsAndStops() to find all potential start and stop codons in longer sequences. For example, say we want to find all potential start and stop codons in the first 500 nucleotides of the genome sequence of the DEN-1 Dengue virus (NCBI accession NC_001477). The variable dengueseq is a vector variable, and each letter in the DEN-1 Dengue virus DNA sequence is stored in one element of this vector. Dengue virus causes Dengue fever, which is classified as a neglected tropical disease by the WHO. "a" "t" "c" "g" "g" "a" "a" "g" "c" "t" "t" "g" "c" "t" "t" "a" "a" "c" "g"
 "t" "a" "g" "t" "t" "c" "t" "a" "a" "c" "a" "g" "t" "t" "t" "t" "t" "t" "a"
 "t" "t" "a" "g" "a" "g" "a" "g" "c" "a" "g" "a" "t" "c" "t" "c" "t" "g" "a"
 "t" "g" "a" "a" "c" "a" "a" "c" "c" "a" "a" "c" "g" "g" "a" "a" "a" "a" "a"
 "g" "a" "c" "g" "g" "g" "t" "c" "g" "a" "c" "c" "g" "t" "c" "t" "t" "t" "c"
 "a" "a" "t" "a" "t" "g" "c" "t" "g" "a" "a" "a" "c" "g" "c" "g" "c" "g" "a"
 "g" "a" "a" "a" "c" "c" "g" "c" "g" "t" "g" "t" "c" "a" "a" "c" "t" "g" "t"
 "t" "t" "c" "a" "c" "a" "g" "t" "t" "g" "g" "c" "g" "a" "a" "g" "a" "g" "a"
 "t" "t" "c" "t" "c" "a" "a" "a" "a" "g" "g" "a" "t" "t" "g" "c" "t" "t" "t"
 "c" "a" "g" "g" "c" "c" "a" "a" "g" "g" "a" "c" "c" "c" "a" "t" "g" "a" "a"
 "a" "t" "t" "g" "g" "t" "g" "a" "t" "g" "g" "c" "t" "t" "t" "t" "a" "t" "a"
 "g" "c" "a" "t" "t" "c" "c" "t" "a" "a" "g" "a" "t" "t" "t" "c" "t" "a" "g"
 "c" "c" "a" "t" "a" "c" "c" "t" "c" "c" "a" "a" "c" "a" "g" "c" "a" "g" "g"
 "a" "a" "t" "t" "t" "t" "g" "g" "c" "t" "a" "g" "a" "t" "g" "g" "g" "g" "c"
 "t" "c" "a" "t" "t" "c" "a" "a" "g" "a" "a" "g" "a" "a" "t" "g" "g" "a" "g"
 "c" "g" "a" "t" "c" "a" "a" "a" "g" "t" "g" "t" "t" "a" "c" "g" "g" "g" "g"
 "t" "t" "t" "c" "a" "a" "g" "a" "a" "a" "g" "a" "a" "a" "t" "c" "t" "c" "a"
 "a" "a" "c" "a" "t" "g" "t" "t" "g" "a" "a" "c" "a" "t" "a" "a" "t" "g" "a"
 "a" "c" "a" "g" "g" "a" "g" "g" "a" "a" "a" "a" "g" "a" "t" "c" "t" "g" "t"
 "g" "a" "c" "c" "a" "t" "g" "c" "t" "c" "c" "t" "c" "a" "t" "g" "c" "t" "g"
 "c" "t" "g" "c" "c" "c" "a" "c" "a" "g" "c" "c" "c" "t" "g" "g" "c" "g" "t"
 "t" "c" "c" "a" "t" "c" "t" "g" "a" "c" "c" "a" "c" "c" "c" "g" "a" "g" "g"
 "g" "g" "g" "a" "g" "a" "g" "c" "c" "g" "c" "a" "c" "a" "t" "g" "a" "t" "a"
 "g" "t" "t" "a" "g" "c" "a" "a" "g" "c" "a" "g" "g" "a" "a" "a" "g" "a" "g"
 "g" "a" "a" "a" "a" "t"
> dengueseqstartstring                        # Print out the variable string of characters "dengueseqstartstring"
 "tag" "taa" "tag" "taa" "tag" "tga" "atg" "tga" "atg" "tga" "atg" "tga" "tga"
 "atg" "tag" "taa" "tag" "tag" "atg" "atg" "atg" "tga" "taa" "atg" "tga" "tga"
 "atg" "atg" "tga" "atg" "tga" "tag" "tag"
We see that the lambda sequence has many different potential start and stop codons, for example, a potential stop codon (TAG) at nucleotide 7, a potential stop codon (TAA) at nucleotide 53, a potential stop codon (TAG) at nucleotide 58, and so on. Potential start and stop codons in a DNA sequence can be in three different possible reading frames. 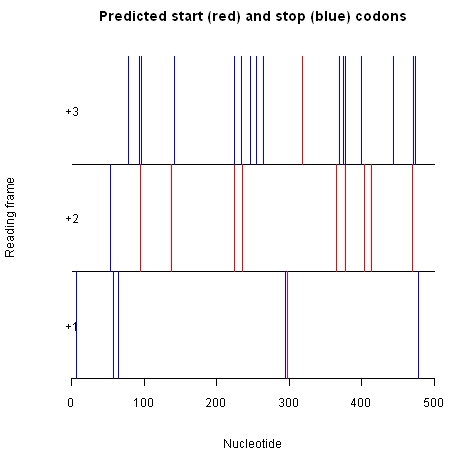 A potential start/stop codon is said to be in the +1 reading frame if there is an integer number of triplets x between the first nucleotide of the sequence and the start of the start/stop codon. Thus, a potential start/stop codon that begins at nucleotides 1 (0 triplets), 4 (1 triplet), 7 (2 triplets)... will be in the +1 reading frame. If there is an integer number of triplets x, plus one nucleotide (ie. x.3 triplets), between the first nucleotide of the sequence and the start of the start/stop codon, then the start/stop codon is said to be in the +2 reading frame. A potential start/stop codon that begins at nucleotides 2 (0.3 triplets), 5 (1.3 triplets), 8 (2.3 triplets) ... is in the +2 reading frame. Similarly, if there is an integer number of triplets x, plus two nucleotides (ie. x.6 triplets), between the first nucleotides of the sequence and the start of the start/stop codon, the start/stop codon is in the +3 reading frame. So a potential start/stop codon that begins at nucleotides 3 (0.6 triplets), 6 (1.6 triplets), 9 (2.6 triplets)... is in the +3 reading frame. For a potential start and stop codon to be part of the same gene, they must be in the same reading frame. From the output of findPotentialStartsAndStops() for the first 500 nucleotides of the genome of DEN-1 Dengue virus (see above), you can see that there is a potential start codon (ATG) that starts at nucleotide 137, and a potential stop codon (TGA) that starts at nucleotide 141. That is, the potential start codon is from nucleotides 137-139 and the potential stop codon is from nucleotides 141-143. Could the region from nucleotides 137 to 143 possibly be a gene? If we look at the sequence from nucleotides 137-143, “ATGCTGA”, we see that it starts with a potential start codon (ATG) and ends with a potential stop codon (TGA). However, the ribosome reads the sequence by scanning the codons (triplets) one-by-one from left to right, and when we break up the sequence into codons (triplets) we see that it does not contain an integer (whole) number of triplets: “ATG CTG A”. This means that even if the ribosome will not recognise the region from 137-143 as a potential gene, as the ATG at nucleotide 137 is not separated from the TGA at nucleotide 141 by an integer number of codons. That is, this ATG and TGA are not in the same reading frame, and so cannot be the start and stop codon of the same gene. The potential start codon at nucleotide 137 of the lambdaseqstartstring sequence is in the +2 reading frame, as there is an integer number of triplets, plus one nucleotide, between the start of the sequence and the start of the start codon (ie. triplets 1-3, 4-6, 7-9, 10-12, 13-15, 16-18, 19-21, 22-24, 25-27, 28-30, ..., 133-135, and a single nucleotide 136). However, the potential stop codon at nucleotide 141 is the +3 reading frame, as there are two nucleotides plus an integer number of triplets between the start of the sequence and the start of the stop codon (ie. triplets 1-3, 4-6, 7-9, 10-12, 13-15, 16-18, 19-21, 22-24, 25-27, 28-30, 31-33, 34-36, 37-39, 40-42, 43-45, ..., 133-135, 136-138, and two nucleotides 139, 140). As the potential start codon at nucleotide 137 and the potential stop codon at nucleotide 141 are in different reading frames, they are not separated by an integer number of codons, and therefore cannot be part of the same gene. To find potential genes, we need to look for a potential start codon, followed by an integer number of codons, followed by a potential stop codon. This is eqivalent to looking for a potential start codon followed by a potential stop codon that is in the same reading frame. Such a stretch of DNA is known as an open reading frame (ORF), and is a good candidate for a potential gene. To use this function, you will first need to copy and paste it into R.
In the picture produced by plotPotentialStartsAndStops(), the x-axis represents the input sequence (dengueseqstartstring here). The potential start codons are represented by vertical red lines, and potential stop codons are represented by vertical blue lines. Three different layers in the picture show potential start/stop codons in the +1 reading frame (bottom layer), +2 reading frame (middle layer), and +3 reading frame (top layer). We can see that the start codon at nucleotide 137 is represented by a vertical red line in the layer corresponding to the +2 reading frame (middle layer). There are no potential stop codons in the +2 reading frame to the right of that start codon. Thus, the start codon at nucleotide 137 does not seem to be part of an open reading frame. We can see however that in the +3 reading frame (top layer) there is a predicted start codon (red line) at position 318 and that this is followed by a predicted stop codon (blue line) at position 371. Thus, the region from nucleotides 318 to 371 could be a potential gene in the +3 reading frame. In other words, the region from nucleotides 318 to 371 is an open reading frame, or ORF. # Find the length of vector "positions"
# There must be at least one start codon and one stop codon to have an ORF. orfstops <- append(orfstops, posj+2, after=length(orfstops)) # Including the stop codon. The function findORFsinSeq() returns a list variable, where the first element of the list is a vector of the start positions of ORFs, the second element of the list is a vector of the end positions of those ORFs, and the third element is a vector containing the lengths of the ORFs. 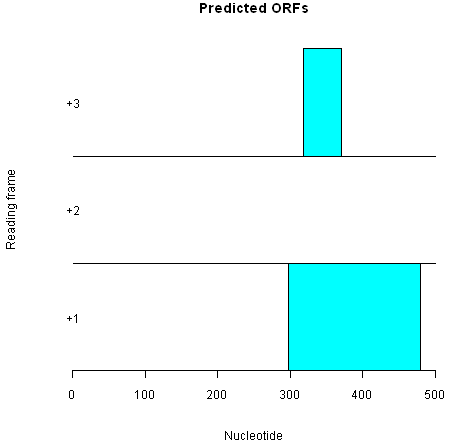 The output for the findORFsinSeq() function for s1 tells us that there is one ORF in the sequence s1, and that the predicted start codon starts at nucleotide 4 in the sequence, and that the predicted stop codon ends at nucleotide 12 in the sequence. The result from findORFsinSeq() indicates that there are two ORFs in the first 500 nucleotides of the DEN-1 Dengue virus genome, at nucleotides 298-480 (start codon at 298-300, stop codon at 478-480), and 318-371 (start codon at 318-320, stop codon at 369-371). numpositions <- length(positions) # Find the length of vector "positions"
The picture produced by plotORFsinSeq() represents the two ORFs in the first 500 nucleotides of the lambda genome as blue rectangles. One of the ORFs is in the +3 reading frame, and one is in the +1 reading frame. There are no ORFs in the +2 reading frame, as there are no potential stop codons to the right (3’) of the potential start codons in the +2 reading frame, as we can see from the picture produced by plotPotentialStartsAndStops() above. > myorf # Print out the sequence of "myorf"
As you can see, the ORF starts with a predicted start codon (ATG), is followed by an integer number of codons (just one codon, CAG, in this case), and ends with a predicted stop codon (TAA). If you have the DNA sequence of an ORF, you can predict the protein sequence for the ORF by using the translate() function from the SeqinR package. Note that as there is a function called translate() in both the Biostrings and SeqinR packages, we need to type seqinr::translate() to specify that we want to use the SeqinR translate() function. > myorfvector               # Print out the value of "myorfvector"
 "a" "t" "g" "c" "a" "g" "t" "a" "a"
From the output of the seqinr::translate() function, we see that the predicted start codon (ATG) is translated as a Methionine (M), and that this is followed by a Glutamine (Q). The predicted stop codon is represented as “*” as it is not translated into any amino acid. Genes in a genome sequence can occur either on the forward (plus) strand of the DNA, or on the reverse (minus) strand. To find ORFs on the reverse strand of a sequence, we must first infer the reverse strand sequence, and then use our findORFsinSeq() function to find ORFs on the reverse strand. The reverse strand sequence easily can be inferred from the forward strand sequence, as it is always the reverse complement sequence of the forward strand sequence. We can use the comp() function from the SeqinR package to calculate the complement of a sequence, and the rev() function to reverse that sequence in order to give us the reverse complement sequence. The comp() and rev() functions require that the input sequence is in the form of a vector of characters. The s2c() function can be used to convert a sequence in the form of a string of characters to a vector, while the c2s() function is useful for convering a vector back to a string of characters. "A" "A" "A" "A" "T" "G" "C" "T" "T" "A" "A" "A" "C" "C" "A" "T" "T" "G" "C" "C" "C"
 "g" "g" "g" "c" "a" "a" "t" "g" "g" "t" "t" "t" "a" "a" "g" "c" "a" "t" "t" "t" "t"
This indicates that there is one ORF of length 9 bp in the reverse strand of sequence “AAAATGCTTAAACCATTGCCC”, that has a predicted start codon that starts at nucleotide 6 in the reverse strand sequence and a predicted stop codon that ends at nucleotide 14 in the reverse strand sequence. 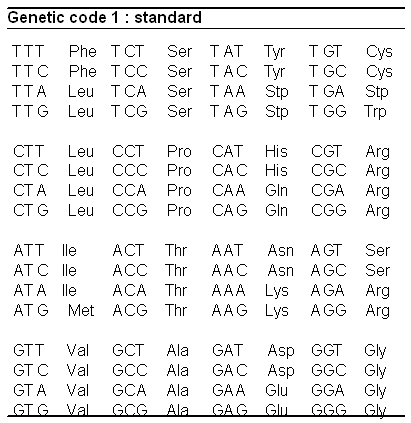 As you can see from the picture displaying the genetic code made using tablecode() (above), three of the 64 different codons are stop codons. This means that in a random DNA sequence the probability that any codon is a potential stop codon is 3/64, or about 1/21 (about 5%). Therefore, you might expect that sometimes potential start and stop codons can occur in a DNA sequence just due to chance alone, not because they are actually part of any real gene that is transcribed and translated into a protein. As a result, many of the ORFs in a DNA sequence may not correspond to real genes, but just be stretches of DNA between potential start and stop codons that happened by chance to be found in the sequence. In other words, an open reading frame (ORF) is just a gene prediction, or a potential gene. It may correspond to a real gene (may be a true positive gene prediction), but it may not (may be a false positive gene prediction). How can we tell whether the potential start and stop codons of an ORF are probably real start and stop codons, that is, whether an ORF probably corresponds to a real gene that is transcribed and translated into a protein? In fact, we cannot tell using bioinformatics methods alone (we actually need to do some lab experiments to know), but we can make a fairly confident prediction. We can make our prediction based on the length of the ORF. y definition, an ORF is a stretch of DNA that starts with a potential start codon, and ends with a potential stop codon in the same reading frame, and so has no internal stop codons in that reading frame. Because about 1/21 of codons (~5%) in a random DNA sequence are expected to be potential stop codons just by chance alone, if we see a very long ORF of hundreds of codons, it would be surprising that there would be no internal stop codons in such a long stretch of DNA if the ORF were not a real gene. In other words, long ORFs that are hundreds of codons long are unlikely to occur due to chance alone, and therefore we can be fairly confident that such long ORFs probably correspond to real genes. How long does an ORF need to be in order for us to be confident that it probably corresponds to a real gene? This is a difficult question. One approach to answer this is to ask: what is the longest ORF found in a random sequence of the same length and nucleotide composition as our original sequence? The ORFs in a random sequence do not correspond to real genes, but are just due to potential start and stop codons that have occurred by chance in those sequences (since, by definition, a random sequence is one that was generated randomly, rather than by evolution as in a real organism). Thus, by looking at the lengths of ORFs in the random sequence, we can see what is the longest ORF that is likely to occur by chance alone. But where can we get random sequences from? In a previous chapter, you learnt that you can generate random sequences using a multinomial model with a particular probability of each letter (a particular probability of A, C, G, and T in the case of random DNA sequences). In that previous chapter, we used the function generateSeqsWithMultinomialModel() to generate random sequences using a multinomial model in which the probability of each letter is set equal to the fraction of an input sequence that consists of that letter. This function takes two arguments, the input sequence, and the number of the random sequences that you want to generate. We can then use the findORFsinSeq() function to find ORFs in this random sequence. If we repeat this 10 times, we can find the lengths of the ORFs found in the 10 random sequences. We can then compare the lengths of the ORFs found in the original sequence, to the lengths of the ORFs found in the random sequences. > mylist <- findORFsinSeq(dengueseqstring)    # Find ORFs in "dengueseqstring"
> orflengths <- mylist[]                   # Find the lengths of ORFs in "dengueseqstring"
mylist <- findORFsinSeq(randseq)           # Find ORFs in "randseq"
lengths <- mylist[]                     # Find the lengths of ORFs in "randseq"
This may take a little time to run, however, the for loop above prints out the value of i each time that it starts the loop, so you can see how far it has got. In the code above, we retrieve the lengths of the ORFs found by function findORFsinSeq() by taking the third element of the list returned by this function. As mentioned above, the third element of the list returned by this function is a vector containing the lengths of all the ORFs found in the input sequence. In other words, the histogram of the lengths of the ORFs in the 10 random sequences gives us an idea of the length distribution of ORFs that you would expect by chance alone in a random DNA sequence (generated by a multinomial model in which the probabilities of the four bases are set equal to their frequencies in the DEN-1 Dengue virus genome sequence). This indicates that the longest ORF that occurs in the random sequences is 342 nucleotides long. Thus, it is possible for an ORF of up to 342 nucleotides to occur by chance alone in a random sequence of the same length and roughly the same composition as the DEN-1 Dengue virus genome. Therefore, we could use 342 nucleotides as a threshold, and discard all ORFs found in the DEN-1 Dengue virus genome that are shorter than this, under the assumption that they probably arose by chance and probably do not correspond to real genes. How many ORFs would be left in the DEN-1 Dengue virus genome sequence if we used 342 nucleotides as a threshold? If we did use 342 nucleotides as a threshold, there would only be 1 ORF left in the DEN-1 Dengue virus genome. Some of the 115 shorter ORFs that we discarded may correspond to real genes. Generally, we don’t want to miss many real genes, we may want to use a more tolerant threshold. For example, instead of discarding all Dengue ORFs that are shorter than the longest ORF found in the 10 random sequences, we could discard all Dengue ORFs that are shorter than the longest 99% of ORFs in the random sequences. We can use the quantile() function to find quantiles of a set of numbers. The 99th quantile for a set of numbers is the value x such that 99% of the numbers in the set have values less than x. This means that 99% of the ORFs in the random sequences have lengths less than 248 nucleotides long. In other words, the longest of the longest 99% of ORFs in the random sequences is 248 nucleotides. Thus, if we were using this as a threshold, we would discard all ORFs from the DEN-1 Dengue genome that are 248 nucleotides or shorter. This will result in fewer ORFs being discarded than if we used the more stringent threshold of 342 nucleotides (ie. discarding all ORFs of <342 nucleotides), so we will probably have discarded fewer ORFs that correspond to real genes. Unfortunately, it probably means that we will also have kept more false positives at the same time, that is, ORFs that do not correspond to real genes. All of these functions belong to the standard installation of R.
For background reading on computational gene-finding, it is recommended to read Chapter 2 of Introduction to Computational Genomics: a case studies approach by Cristianini and Hahn (Cambridge University Press; www.computational-genomics.net/book/). For more information on and examples using the Biostrings package, see the Biostrings documentation at http://www.bioconductor.org/packages/release/bioc/html/Biostrings.html. There is also a very nice chapter on “Analyzing Sequences”, which includes examples of using the SeqinR and Biostrings packages for sequence analysis, in the book Applied statistics for bioinformatics using R by Krijnen (available online at cran.r-project.org/doc/contrib/Krijnen-IntroBioInfStatistics.pdf). Many of the ideas for the examples and exercises for this practical were inspired by the Matlab case study on the Haemophilus influenzae genome (www.computational-genomics.net/case_studies/haemophilus_demo.html) from the website that accompanies the book Introduction to Computational Genomics: a case studies approach by Cristianini and Hahn (Cambridge University Press; www.computational-genomics.net/book/). Model answers to the exercises are given in Answers to the exercises on Computational Gene-finding. Q1. How many ORFs are there on the forward strand of the DEN-1 Dengue virus genome (NCBI accession NC_001477)? Q2. What are the coordinates of the rightmost (most 3’, or last) ORF in the forward strand of the DEN-1 Dengue virus genome? Q3. What is the predicted protein sequence for the rightmost (most 3’, or last) ORF in the forward strand of the DEN-1 Dengue virus genome? Q4. How many ORFs are there of 30 nucleotides or longer in the forward strand of the DEN-1 Dengue virus genome sequence? Q5. How many ORFs longer than 248 nucleotides are there in the forward strand of the DEN-1 Dengue genome sequence? Q6. If an ORF is 248 nucleotides long, what length in amino acids will its predicted protein sequence be? Q7. How many ORFs are there on the forward strand of the rabies virus genome (NCBI accession NC_001542)? Note: rabies virus is the virus responsible for rabies, which is classified by the WHO as a neglected tropical disease. Q8. 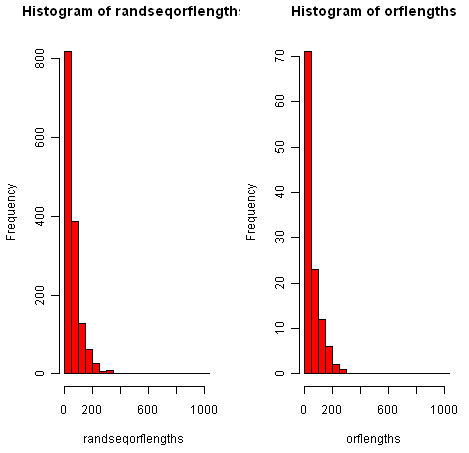 What is the length of the longest ORF among the 99% of longest ORFs in 10 random sequences of the same lengths and composition as the rabies virus genome sequence? Q9. How many ORFs are there in the rabies virus genome that are longer than the threshold length that you found in Q8?